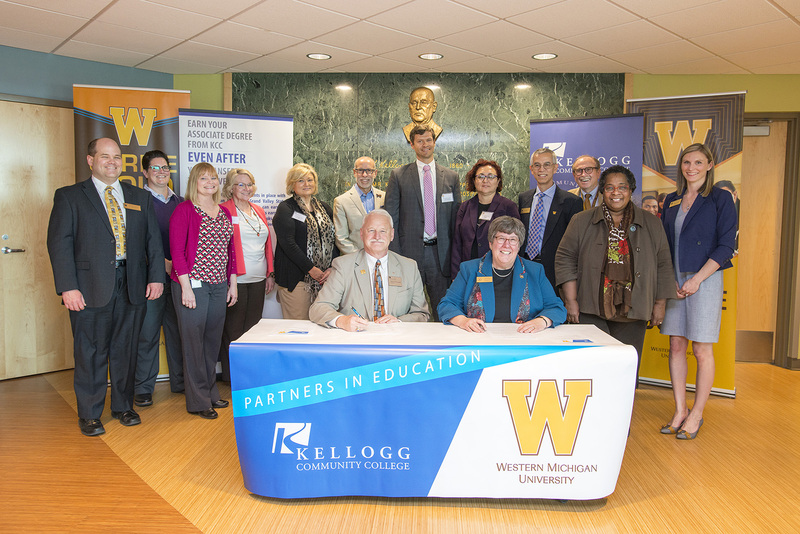 Kellogg Community College and Western Michigan University today signed a major agreement that will create a smoother process for KCC graduates who transfer to WMU. The agreement between KCC and WMU is a solution locally for what is a national challenge. According to a U.S. Government Accountability Office report in 2017, students who transferred from one college to another between 2004 and 2009 lost, on average, an estimated 43 percent of their credits. When credits won’t transfer, students face having to pay for and repeat courses at their next institution, which can delay their graduation. In many cases, the underlying problem is the absence of a comprehensive articulation agreement between the schools.